I prefer to use my blog and my social media to be comical, weird and a little-too-self-indulgent. I prefer to tell jokes and stories and occasional bits of fiction, rather than wax philosophically about politics or religion or justice. And yet, I feel compelled to chirp out a few thoughts on all of those “deep” topics right now. In the midst of some very heavy headlines, I’m feeling a burden to use my words to speak truth and love in place of my usual comical programming. Be patient with me? The older I get, the less significant I feel. I don’t actually think I can change the world. I don’t think what I put on this little blog will make much of a difference. But I have to do it anyway, because it’s the only chance I’ve got. The older I get the more problems I see in the world (I don’t actually think the problems are getting worse, but news is traveling faster and faster each day as our world gets smaller and smaller). I used to see solutions. I used to be a girl with ideas spilling out her ears. How do we stop poverty? We share. How to we stop hunger? We grow, we share. How do we stop war? We make peace, we grow, we share. Maybe it is. I realize now that the solutions are actually all the same. How do we stop poverty? We see the poor as humans, not problems. How do we stop hunger? We see the hungry as humans, not projects. How do we stop war? We see the “other side” as humans, not enemies. How do we keep a black kid from getting shot in the street by police? We see a HUMAN. I don’t think the narrative that Michael Brown was a “good kid” is the most important part of the story. What if he wasn’t? Shouldn’t he still be alive? Because he is HUMAN. He should be alive because LIFE MATTERS. Because a black man’s life is valuable in the same currency as a white man. That currency is our HUMANITY. Refugees escaping the violent streets of El Salvador should be treated like HUMANS, not herded to “holding cells” like cattle. When did we stop seeing humanity? It matters that they are children. Children who walked nearly 4,000 kilometers to find a safe place to live. That matters, but isn’t the most important part that they are simply PEOPLE? A Palestinian child should be alive BECAUSE SHE IS HUMAN. She is not an unfortunate casualty of war. She is a victim of injustice. She is a victim of racism. She is a victim of INHUMANITY. This isn’t okay. I’m just a middle-class, blue-eyed white woman from the Pacific Northwest. My words are only important here because I am HUMAN. I expect my humanity to be acknowledged. Don’t we all deserve that? 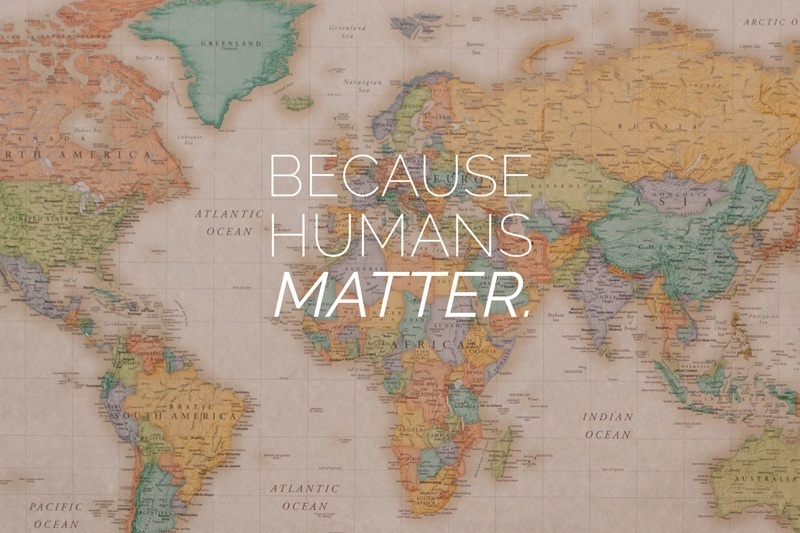 “because life matters.” simple and yet, how easily we forget. Thank you for being here with me, Steph. I’ve been thinking a lot about this, Sarah. And of how important it is for me to accept all of humanity, too. It’s a big task, yet I think my willingness to accept what is: that we are sometimes judgmental and unfair and irrational and class-focused . . . all of us. And therein lies the key — to remembering that we ALL are prone to this kind of imperfect at times . . . that ALL of us are perfectly human — perfectly imperfect. Grace says we all matter. And that’s where I can rest — in knowing I matter, even my idealistic ideas . . . and even those who I disagree with and who I’m disappointed by, they also matter . . . so acknowledging all of us is where it starts, I think. Right on, sister. Thank you, Amy. Thank you for seeing humanity and standing with me here.